The former Peruvian president, facing murder and kidnapping charges, portrays himself as his nation's savior. A judicial tribunal's verdict is due early next week. Reporting from Bogota, Colombia -- Former President Alberto Fujimori of Peru made an impassioned plea of innocence at his human rights crimes trial in the Peruvian capital, portraying himself Friday as the leader who rescued his country from anarchy, not the man prosecutors have cast as a "Frankenstein" monster. "Rather than prove my guilt, the prosecution has merely shown the inconsistency of its accusations," Fujimori said, alleging that prosecutors fabricated evidence in their effort to make an "iceberg from a piece of ice." Fujimori, 70, is being tried on charges that he ordered kidnappings and two massacres in the early 1990s at the height of the state's war on the Shining Path leftist insurgency. The 15-month trial in Lima stands as a rare example of a Latin American leader being called to answer for alleged abuses of power, and provides a forensic look into the former president's time in office, from 1990 to 2000. The judicial tribunal is expected to render a verdict as early as Tuesday. 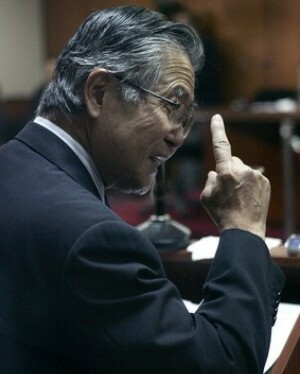 On the trial's last day, Fujimori portrayed himself as the nation's savior. He said he faced a guerrilla group that at one time controlled nearly two-thirds of Peru's territory, terrorizing the populace with bombings and massacres. Under Fujimori, the country's armed forces took back most of the country and reestablished a state presence. But prosecutors allege that Fujimori commanded the so-called Colina secret police force that committed numerous atrocities during a "dirty" war against the insurgents. The Colina group is accused of gunning down 15 people -- including an infant boy -- in Lima's Barrios Altas district in 1991 and of kidnapping and killing nine students and a professor from La Cantuta University in the capital the next year. In his defense, Fujimori said his spy chief, Vladimiro Montesinos -- now in prison for arms trafficking and corruption -- commanded the unit and kept the president in the dark about its actions. During the trial, Fujimori likened crimes against humanity to a "tumor that could emerge from any healthy organism." The verdict could hinge on whether judges overlook the lack of written evidence connecting the former president to the killings. His critics say such evidence is no requisite to proving culpability. Fujimori resigned and fled to Japan in 2000 after videos emerged showing Montesinos bribing other politicians. In late 2005, Fujimori attempted a political comeback by returning to Chile months before Peru's presidential election. But Chilean authorities arrested him, and he was extradited to Peru in September 2007 to face the murder and kidnapping charges. Fujimori's daughter, Keiko, is a congresswoman in Peru and leads in some polls for the 2011 presidential election. She told The Times in an interview last month that she would pardon her father if he were convicted and she was elected president. Special correspondent Adriana Leon in Lima contributed to this report.